The numbers are out there. For over three years the numbers have been reported on everything from how many people with diabetes could receive the medications they need to control this chronic condition to the number of jobs that could be created in each county. The numbers even show how some of the most vulnerable like children or even those that served the United States could finally gain access to the care they need if state lawmakers expanded Medicaid. Unfortunately, the numbers have not influenced leadership in the legislature. 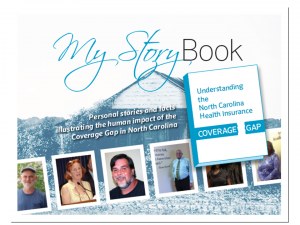 Since the numbers and reports did not convince state lawmakers, perhaps the faces and stories of real North Carolinians will help lawmakers understand that the Medicaid Blockade hurts real people. One real person is Kent. He is a construction worker for a small family-owned business. In fact, reports show that approximately 59,000 North Carolinians in the coverage gap have jobs in construction. Another real person is Roosevelt. He is one of the 12,000 veterans that would benefit is leadership in the General Assembly would expand Medicaid. Both of these men make too much money to be eligible for Medicaid under North Carolina’s current stingy standards, but not enough to be able to afford to but insurance in the marketplace. Roosevelt’s situation is made even more ridiculous and outrageous by the inaccessibility of Veterans Administration healthcare services.